This past Sunday, Alice finally did what I had been imagining for a while....she climbed out of her crib and fell on the hardwood floor. Larry and I had been discussing for a while what we were going to do for Alice's next bed...should we get a temporary toddler bed, or go ahead and buy her the twin bed set that would be her bedroom suite until she went away to college. We thought we would have a few more months - or at least weeks - to make our decision, but last Sundays traumatic event pushed the issue to a decision. We decided to go the toddler bed route. That gives us time to decide on what we wanted to eventually buy for her permanent bedroom suite. 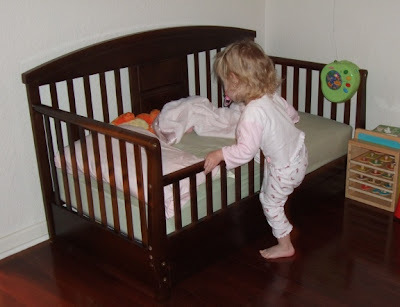 We put the toddler bed together today and disassembled the crib. Alice was both excited about the bed, and a little concerned about the demise of her crib. There were tears, and some tantrums, but we finally proceeded with the normal bedtime routine (started a little late...) - bath, tv show on mom's lap, and then off to bed. Alice fell asleep within 5 minutes in her new bed with her head and tigger's head atop a pillow for the first time. We'll see how the night goes, but fingers crossed for an uneventful night. How did it go? Did she sleep through the night? the night went well...only one wake up, but back to sleep quickly.